If you are a bit of a pig and you like Winnie the Pooh then you should check out this Piglet Onesie Pajama. This piglet onesie is available in adult sizes Small – XL and will look great on both men and women. As you can see the whole pajama looks like Piglet in the pink and purple colors and there is a hood that has the face of Piglet complete with his pig nose and ears sticking out of the fabric. On the front of this outfit you can find buttons to make it easy to wear. Cosplay, Halloween, or lounging and sleeping at home this piglet outfit is what you need. If you like your tea out of great looking teapots then you are in luck because now there is a Piglet teapot that looks like it just walked out of the Winnie the Pooh stories. 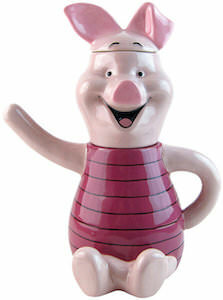 This Piglet set is not just a teapot it’s also a mug. The teapot looks like the body of Piglet with one arm being the handle and the spout being the other arm. On top of the teapot is the head of piglet witch is the mug and on top of that you find the lid that fits the mug and the teapot and looks like the top of Piglet head that includes it’s ears. It’s just so adorable to see Winnie the Pooh’s friend made into a teapot that is just amazing and great for collectors and tea drinkers. Winnie and his friends are cute and funny. 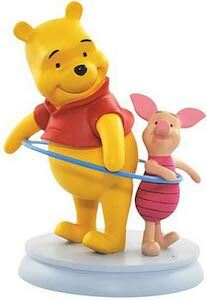 And now you can have a little mini statue of Winnie the Pooh while he is doing hoola hoops with his friend Piglet. This figurine has amazing details and will be a focal point of your home. Kids will be attracted to it but unfortunately it is not a toy. At 4 3/4 inch tall this Winnie the Pooh figurine is just fun to have and it will deserve a special spot in your home. It’s always fun to see animals interact with each other but a bear and a pig playing with a hoola hoop is rare. Are you planning a Winnie the Pooh theme birthday party or baby shower? Well you will defiantly need to start with getting these cute Pooh party napkins because every party needs napkins to wipe there hands after enjoying all the party goodies. 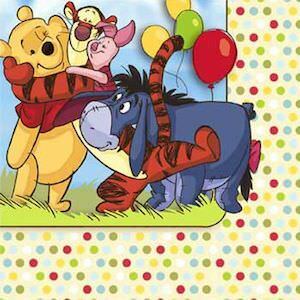 These cute Winnie the Pooh napkins features Pooh receiving a big group hug from is good friends Tigger, Piglet, and Eeyore with some balloons on 3/4 of the napkin. The rest of the napkin is covered in colourful polka a dot. Your kids will have lots of fun pretending to party with Pooh and friends. Start you planning now and begin with these Winnie the Pooh Paper Party Napkins. Winnie The Pooh and friends are looking for a party? Let Pooh bear, Tigger, Piglet, and Eeyore be a part of your party with these special Pooh and friends paper plates. 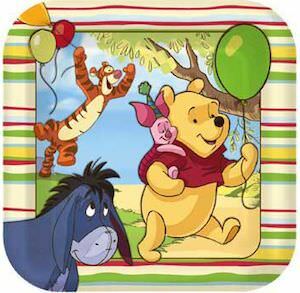 These colorful party paper plates features a picture of Winnie the Pooh, Tigger, Eeyore and Piglet with balloons happily on there way to your party. The paper plates come in a pack of 8 plates and are 9 inches square in size. Perfect for all your yummy favourite party foods like hot dogs, chips, pizza or cake. Your kids will have so much fun eating off these fun Pooh party plates. Make your party into a Pooh theme party and start with these Winnie The Pooh Paper Plates. Are you planning a Winnie The Pooh themed party? If so you will need these Pooh and friends party cups to drink from. These party cups feature’s Pooh Bear, Tigger, Piglet and Eeyore carrying a balloon around his neck happily going to a party of there own. They come in a pack of 8 and will hold 9 ounces of your most favourite party beverage. 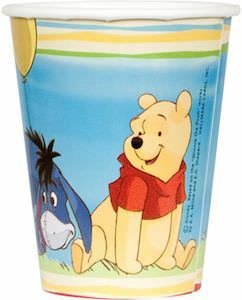 When the kids drink from these Pooh paper cups they will pretend to go on adventures like Pooh and his friends go on. Your kids will have lots of fun drinking from these Winnie The Pooh And Friends Party Cups. Why have a party with boring cookies that you can find in any store? What you can’t find anything that looks better. 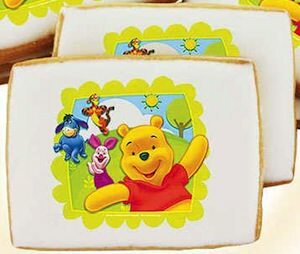 Lucky for you we found these amazing Winnie the Pooh butter shortbread cookies. These cookies are hand made with the finest ingriedients and all have an amazing picture of Winnie and his friends Tigger, Eeyore and Piglet on them. Each cookies is about 2.5″ x 3.25″ and has a light sugar icing. And these cookies come in a box of a dozen cookies. Come and see these amazing Winnie The Pooh Shortbread Cookies. This musical snow globe is perfect for a birthday. It shows Winnie the Pooh and Piglet both with a present hiding behind their backs and it has a Happy Birthday banner on it to. And that is not all because this Winnie the Pooh snow globe plays happy birthday. So if you know a snow globe collector with a birthday coming up this would be the perfect gift. 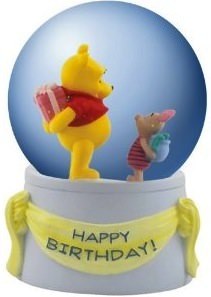 Come have a closer look at this Winnie The Pooh And Piglet Musical Birthday Snow Globe. How about a fun pillow to remind us of the birth of a loved one. This Winnie the Pooh pillow does exactly that. 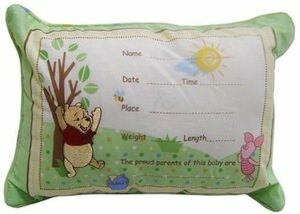 On this pillow there is room to write down all the info about the birth of you baby and besides that you can find a Winnie the Pooh scene with of course Winnie and his pig friend Piglet. This Keepsake pillow of course makes the perfect gift for the baby shower. Come have a better look at this Winnie the Pooh Keepsake Pillow. There we have Piglet the piggy friend of Winnie the Pooh. And this Piglet needs a new home, it looks for a place where people will play with her and cuddle a lot to. This is a soft and cuddle plush toy that is 13″ tall and looks just like Piglet from Winnie the Pooh. 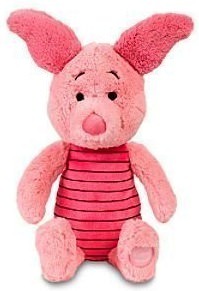 If your Winnie the Pooh collection is still missing Piglet then come and addopt this Piglet Plush Toy.